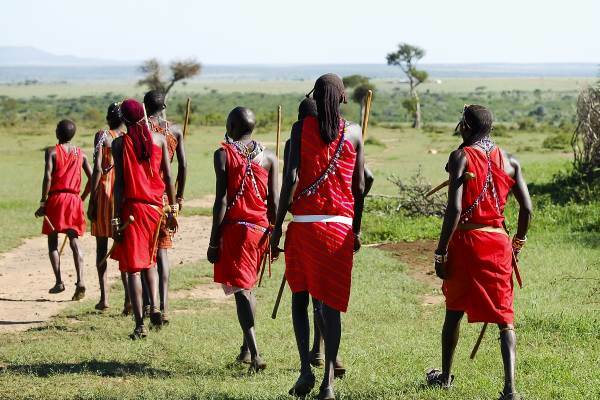 The Accommodated Cape Town To Nairobi overland tour offers the very Best of Africa. From wine tasting in the Cape, sunrise in the desert, to a fly in Lodge experience in the Okavango Delta. The mighty Victoria Falls, the spice island of Zanzibar, tribal encounters and unbelievable wildlife viewing in the Serengeti and Ngorongoro make this a trip of a lifetime. A comfortable overland tour. Note: That this tour has a camping option (see full tour pricing) and runs in both directions Start either in Cape Town or Nairobi. Our overland tour begins in Cape Town and our first stop is to take photos of Table Mountain from Blouberg Strand. Travelling north we pass through the spectacular Cederberg Mountains to our first camp. We have an opportunity to taste some of the local wines before enjoying a traditional South African meal. After breakfast we head for our next destination – the Orange River. En route we pass through Namaqaland, which is famous for its spring flowers. The river was originally called the Gariep River (River of Hope) by the local indigenous people. The river is the longest in South Africa and forms a natural border between Namibia and South Africa. Our accommodation is on the banks of the river. The morning is at your leisure and you can choose to take a morning canoe trip or alternatively relax at camp, soak up the sun and swim in the river. After lunch we make our way north to the Fish River Canyon. The Fish River canyon is the second largest in the world and has spectacular landscapesand views. We enjoy a late afternoon walk along the rim of the canyon – have your cameras ready. We overnight at Ais-Ais where you have an opportunity to enjoy the hot springs. A very early start so we can enjoy a spectacular sunrise over the desert. Those with energy can climb the famous Dune 45 and enjoy a view across the immense sand dunes of the desert. The sunrise provides amazing contrasts of shadows across the dunes and is a photographers dream. We head further into the desert to Soussusvlei. There is time to explore the Dead Vlei – with its ancient trees and amazing sand dunes. We partake in a hike with a local to learn how the Bushmen survive in this harsh desert terrain. After an exciting day we head back to camp. Included activity: Sesreim Canyon and sunrise hike up Dune 45. After breakfast we continue north to Swakopmund – the desert capital. En route we stop at the Tropic of Capricorn as well as Walvis Bay to see the resident flamingos. Swakopmund is a welcome break after the harshness of the desert. 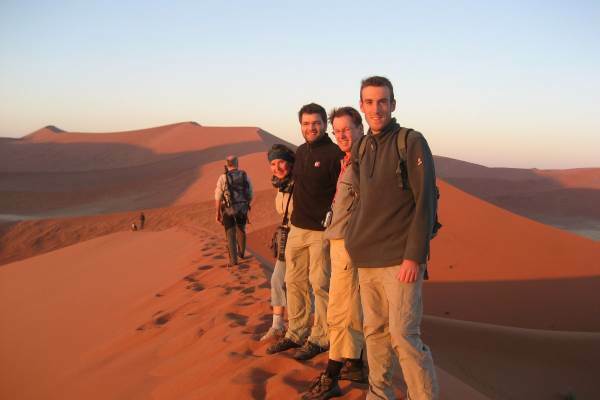 It is also the adventure capital of the desert and there are many optional activities to choose from. Today is spent at your leisure and pleasure. You can partake in one of the many desert activities on offer or you can take in the town, enjoy lunch and stock up on personal provisions for the remaining tour. We leave the coastline and head for the Spitzkoppe, which stands out prominently on the flat landscape. The Spitzkoppe is known for its huge granite boulders and large number of Bushmen paintings. The afternoon is spent exploring this moon like landscape taking in the ancient Bushmen paintings with a local guide, or one can go boulder climbing. We spend the evening at Khorixas. Today we have an opportunity to visit a Himba village where we can get an insight into the daily lives of this indigenous tribe. The Himba are semi-nomadic, and there traditional pastures and land has been mostly taken over by western influences. The tribal lifestyle of the Himba is now protected and the village we visit is an educational experience for those wanting to experience their customs and traditions first hand. All monies raised go towards an educational fund for the tribe. An early morning sees us making the short transfer to Etosha National Park where we set off on our first safari game drive. The next two days are spent exploring this magnificent game reserve. Etosha is known for its abundance of elephant and predators. The waterholes are frequented by many species of animals and one can expect to encounter huge herds of zebra, antelope and giraffes. Game viewing is generally very good as the sparse vegetation allows for excellent sightingsof a wide range of animals. The campsites have flood lit waterholes and one can spend the night watching wildlife come drink. We also enjoy a visit to the huge salt pan after which Etosha is named. There is an option to partake in a night drive with the park rangers. The day begins with a short game drive to Etosha National Park gates and we head for Windhoek – the capital of Namibia. We include a stop at a large and popular curio market where there is ample time to shop for some last minute gifts. Arriving in Windhoek in the late afternoon, there is more than enough time to explore the city with its German heritage. Today we leave Namibia and cross the border into Botswana. After we set up camp at Ghanzi - located in the Kalahari Desert- we have an opportunity to interact with the local Bushman tribe. In the evening we enjoy some traditional dancing around the camp fire. This morning we have opportunity to join local “San” guides who offer an informative insight into life in the Kalahari. In the afternoon we make our way to Maun – the gateway to the Okavango Delta. On route we pass many local villages. We set up camp on the shores of the delta. 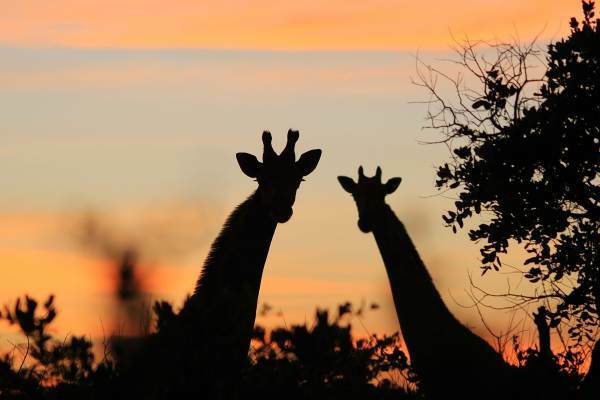 The Okavango Delta is Botswana’s most popular destination. It is the world’s largest inland delta and is home to a large range of wildlife and birdlife. After a relaxed start to the day, we board our flight and head deep into the Okavango Delta. The next couple of days are spent exploring this true wilderness area. We will spend time with locals poling through the waterways and channels of the delta, take nature walks and get to take in this unique ecosystem. Evenings are spent around the campfire enjoying the sounds of the African bush. Note: activities may vary according to water levels. After transferring back to Maun, we board our overland truck and head to Nata. En route we pass the edge of the Makgadigadi Pans, many indigenous Baobab trees and may encounter wildlife in this huge protected area. An early morning breakfast and we head for Kasane, a real frontier town on the banks of the Chobe River. On arrival we set off on an open vehicle game drive. Chobe is best known for its large herds of elephants and a high concentration of predators – notably lions. 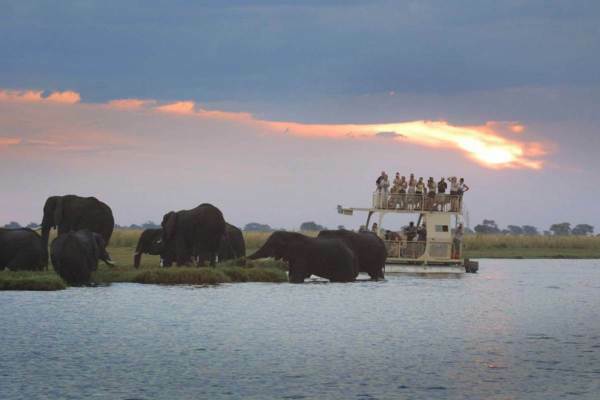 In the late afternoon we experience a safari boat cruise along the Chobe River. Hippos and crocodiles abound. One can also expect to see a variety of animals on the banks of the river, including elephant, giraffe, zebra, wildebeest and antelope. Have your cameras ready. This morning we head for our final destination – Victoria Falls – “The Smoke that Thunders”. The falls are one of the seven natural wonders of the world and the expanse of falling water is absolutely spectacular. The spray from the waterfall creates a natural rain forest around the falls. In the afternoon we will visit the falls and take in this breath taking phenomenon. 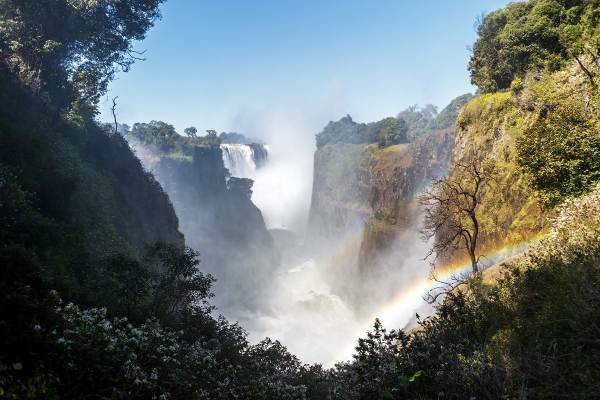 Today we have an opportunity to explore the Victoria Falls and surrounding area. Victoria Falls is well known as an adventure town and there is much to do. The Zambezi River offers some of the best white water rafting in the world. One can bungee jump, sky dive, take a scenic flight, browse the local craft markets or just take in the splendour of the Falls. This morning we cross the Zambezi River and enter Zambia – providing us with an opportunity to view the Victoria Falls for the final time. After the excitement of the Falls, we spend the next 2 days travelling through rural Zambia. We spend the evening on the outskirts of Lusaka. A fairly long day of travel waits as we travel east through rural Zambia. Along the way we will encounter colourful markets, traditional villages and subsistence farming. Our first stop of the day is Chipata, an important trading town. Chipata is a textile town and is famous for its colourful African fabrics which are popular amongst the local population. There is an opportunity to enjoy a quick tour of the workshops and dye houses. (March - December). We enjoy sunset overlooking the famous Luangwa River. The day is spent exploring this famous National Park. 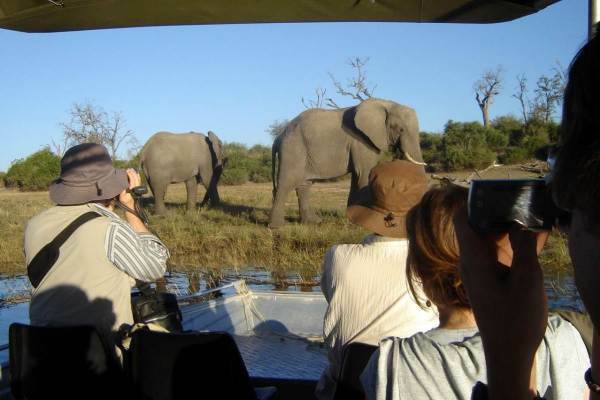 In the morning we have an option to do either a morning safari or you can partake in a popular Big 5 walking safari. (the walking safari is seasonal). This afternoon we enjoy a game drive that extends into the evening, providing us with an opportunity to spot some nocturnal animals. Optional Activity: Morning game drive or Game walk. An early start as we head for Malawi – The Warm Heart of Africa. Malawi is famous for its incredible fresh water lake. The lake has more species of fresh water fish than any other lake, which many are found in fish tanks around the world. The Malawian people are known for their friendliness and openness, which all makes for an incredible country to spend time in. We spend the night on the shore of the lake. Today we travel north along the lake to our next stop where we will spend the next three nights soaking up the splendour of Malawi. The swimming and snorkelling are amazing and one can spend hours in the warm water. For those with energy there is an opportunity to hike up the Nyika Plateaux to Livingstonia. Malawi provides the ideal setting to relax (chill out in one of hammocks) and to explore the local villages. The people are welcoming and one can browse the local markets. We take some time to visit the town of Karonga, whose history is linked to the slave trade. After a relaxing time on the lake we say goodbye to Malawi, as we continue our journey north into Tanzania. We spend the evening in Iringa – a popular stop over for overland tours. Leaving Iringa, we head to Mikumi National Park, which is part the famous Selous National Park – the largest in Africa. The afternoon provides an opportunity for a game drive and an opportunity to spot more animals. Activity Package: Mikumi National Park. Leaving Makumi, we head to Dar es Salaam – the gate way to Zanzibar. Dar es Salaam is the largest city in Tanzania with a rapidly growing population and an important port in East Africa. Tonight we have an opportunity to eat out. This morning we ferry across to Zanzibar – The Spice Island. After a short spice tour, we head north to Nungwi, renowned for its pristine beaches. We will spend the next couple of days relaxing, swimming, snorkelling, diving and soaking up the sun. Nungwi offers incredible beaches, and one can enjoy the local bars, restaurants and other activities. The snorkelling trip is highly recommended as the coral and sea life are incredible. Alternatively you can explore the local fishing villages or take in the turtle sanctuary. After a final swim, we transfer down to Stone Town. Stone Town has a rich history. The slave trade was dominant and you can visit the old slave markets. The historical tie with the sultans of Middle East is evident in the architecture of the old town. You can spend hours wandering around the maze of the old Town, taking in an array of shops and markets. The evening can be spent enjoying the varied nightlife. A last chance to explore Stone Town and perhaps buy some gifts and curios. In the afternoon we ferry across to Dar es Salaam, pack up and head to the town of Bagamoyo. This morning we head north to the safari town of Arusha. En route we may get a glimpse of Mt. Kilimanjaro. 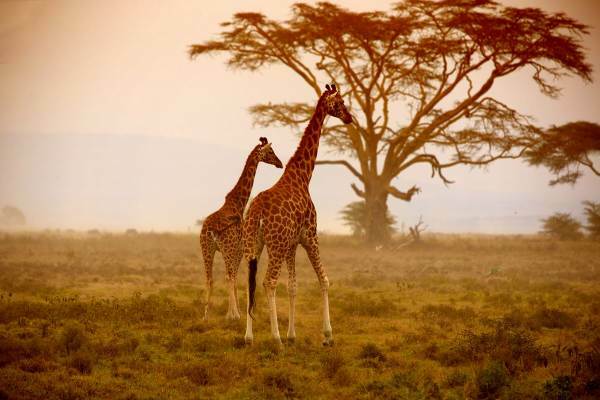 Arusha is a bustling frontier town and is the gathering point for the Serengeti excursion. The next 3 nights will be spent in the Serengeti National Park. The Serengeti National Park is famous for its high concentration of animals and for the largest mammal migration on earth, when tens of thousands of wildebeest and zebra move for greener pastures. 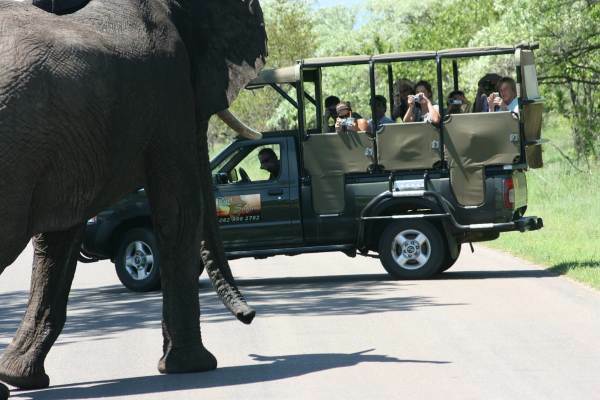 Our game drives are conducted in open top 4 x 4 vehicles. The days are spent game viewing and enjoying the open savannahs. Serengeti safaris are known for their excellent game viewing and one can expect to see a wide range of animals including the major predators. We spend a day descending into the Ngorongoro Crater where the animal viewing is excellent. The Serengeti safari is definitely one of the highlights of the tour. Note all camps in the Serengeti are controlled and maintained by the Tanzania National Parks Board. Today we bid farewell to the Serengeti with a final game drive before heading back to Arusha where we arrive in the early evening. Today we cross the border into Kenya and head to the bustling capital of Nairobi where our tour comes to an end. DEAL: 10% OFF SELECTED DATES!